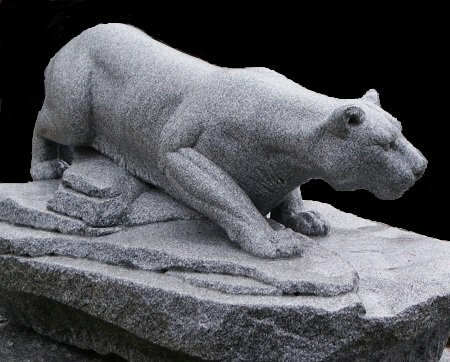 Winter is a difficult time for a stonemason, as it is often to cold or wet to work. 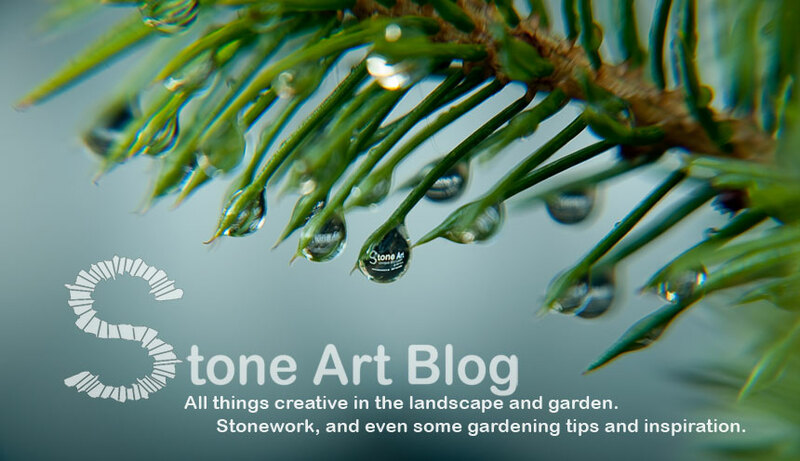 At this time of year you will find many twitchy stonemasons bundled up in their homes or studios like children waiting for the rain to stop so that they can go back out and play. This is, however, a great time to get inspired and conjure up interesting projects for the spring. 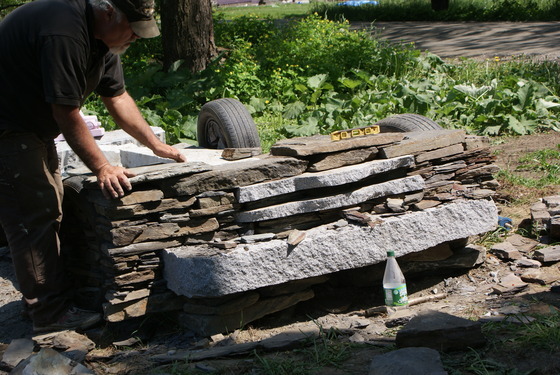 This is exactly what Vermont sculptor and stonemason Chris Miller did. 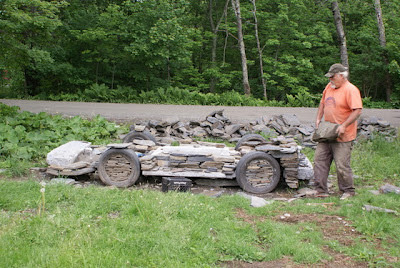 Inspired by this stone VW beetle built in a field close to Ithaca New York in 1976, Chris dreamed up his own little art project. 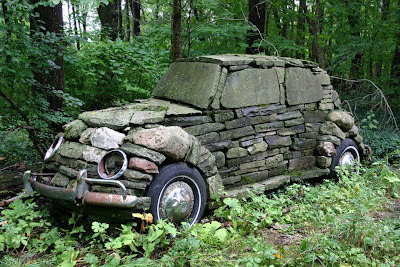 In the same spirit as the stone VW installation, Chris wanted to create a permanent installation that would both generate curiosity and inspire passers by. 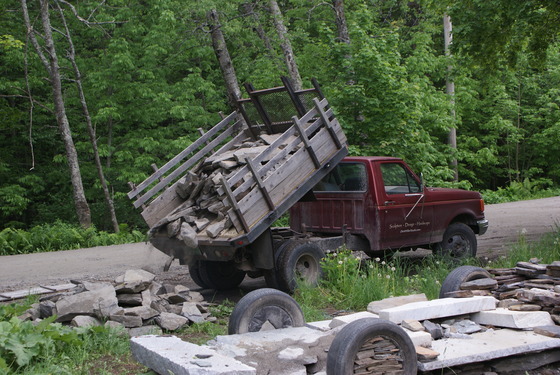 Having always been drawn to the relics of past industry, Chris noted that every little town in Vermont is blessed with rusty old farm trucks, abandoned and overgrown right where they came to rest. A stone truck would surely make a fitting tribute to these relics of past industry. So now the concept was set, all he needed was the finances to build it. Most stonemasons and wallers are all very creative and artistic people, the only thing that suppresses their creativity and ability to create wonderful pieces of art is getting the opportunity from a client to build something a little different. Getting a client who is willing to give you full artistic licence is a wonderful but sadly rare thing, so the creation of websites like fundit and kickstarter have done wonders for creativity and art. Basically these websites provide a platform for people with great ideas to attract funding from friends, fans and followers across the world. People interested in funding a creative concept 'pledge' anything from as little as $1 towards a project. The great thing about this system is that when pledging a donation, no money is taken unless the full funding goal amount is reached. 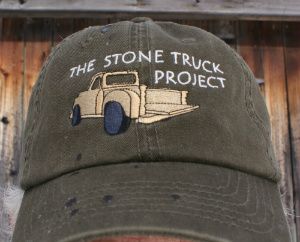 In March of this year Chris Miller set up a kickstarter page in hope of funding his stone truck project. With a modest funding goal of $2,500, Chris put out the call for funders. And to his delight a total of 85 'stone mad' art lovers from many different corners of the world backed the project. This meant that Chris could finally get cracking on the project, so in early May, he eagerly got to work. So five weeks later the Stone Truck project was completed and ready to be discovered by passers by, hopefully filling them with intrigue and wonder for years to come. A very interesting 3 minute stop motion movie of the construction. 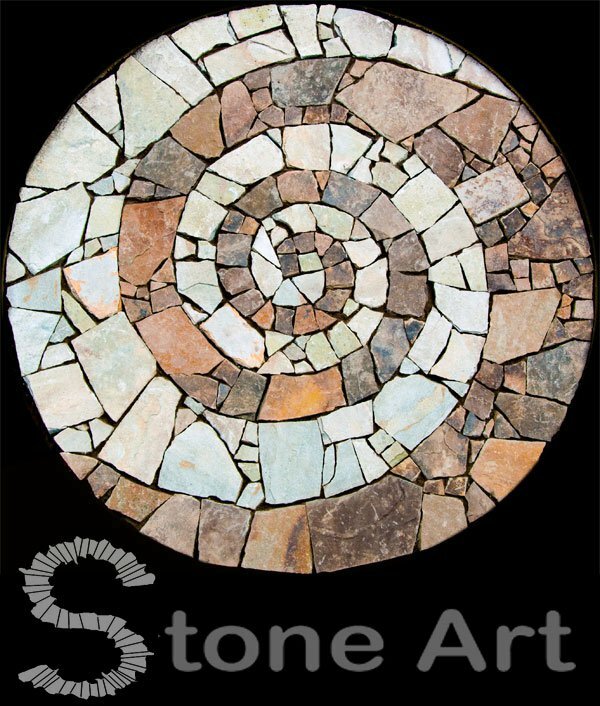 Be sure to check out Chris' website http://chrismillerstudio.com/ to see more of his wonderful stonework and sculptures. Two of my personal favourite pieces of his work are below. 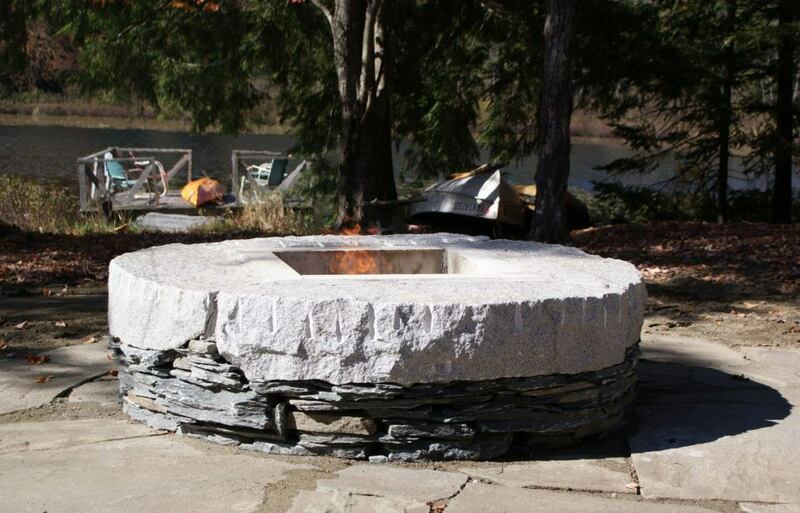 Firepit by Chris Miller. Granite top, Vermount bluestone and Marble fire insert. Hopefully this post inspires you to go out and create your own piece of stone art, or better still, inspires you to contact your local stonemason or dry-stone waller to commission your very own piece of art. I know for sure they are eagerly awaiting your call. 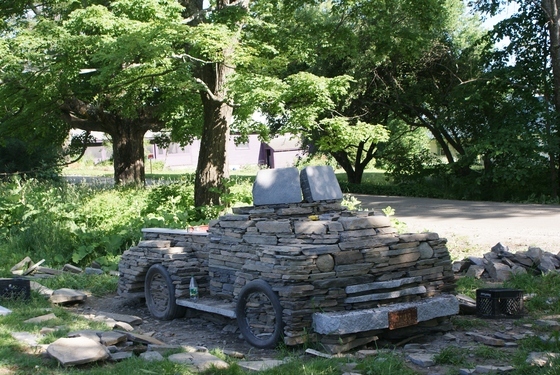 There's novelty and surprise around every corner on Vermont's back roads. Glad you found a great example to share. Just want say thanks for that information and facts you've shared. Regards! Nice post. By sharing this post with us you have proved that we can use stones in many ways what needs for that is hard work and innovative thinking of a landscape. I should say you are doing a great job. Good article, I am loving the truck.The design and building is top notch. wow! 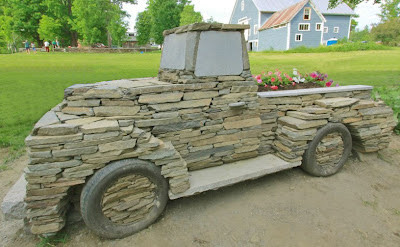 It must be hard work to build stonecars! I concur with your conclusions and will eagerly look forward to your future updates. Thanks a lot and keep on posting more valuable information. 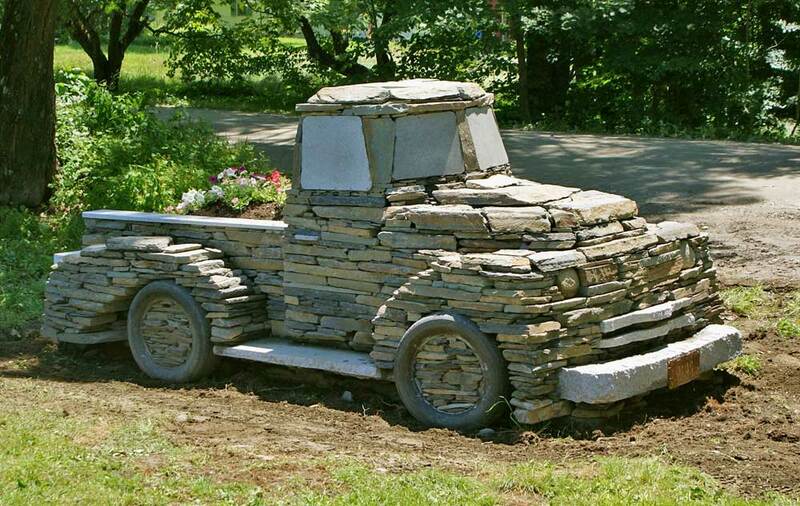 Awesome creativity with stone! 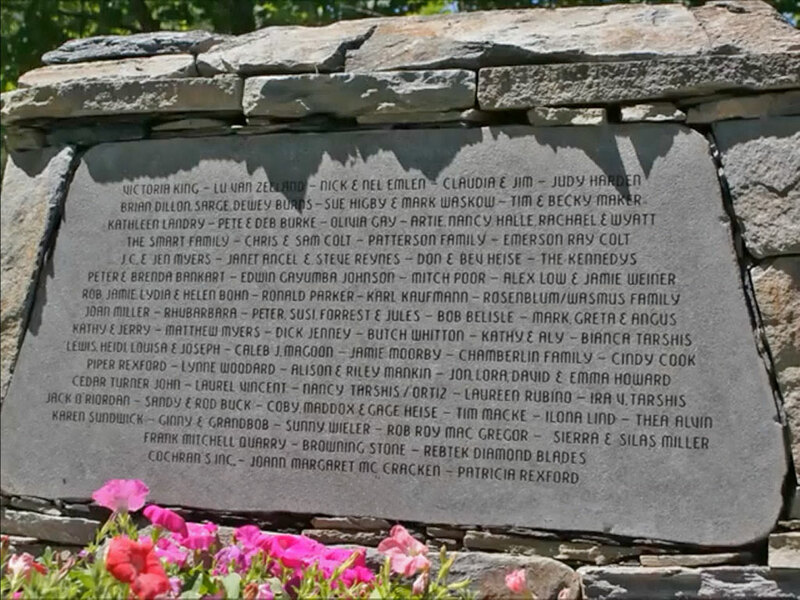 Hats off to these stone artists! 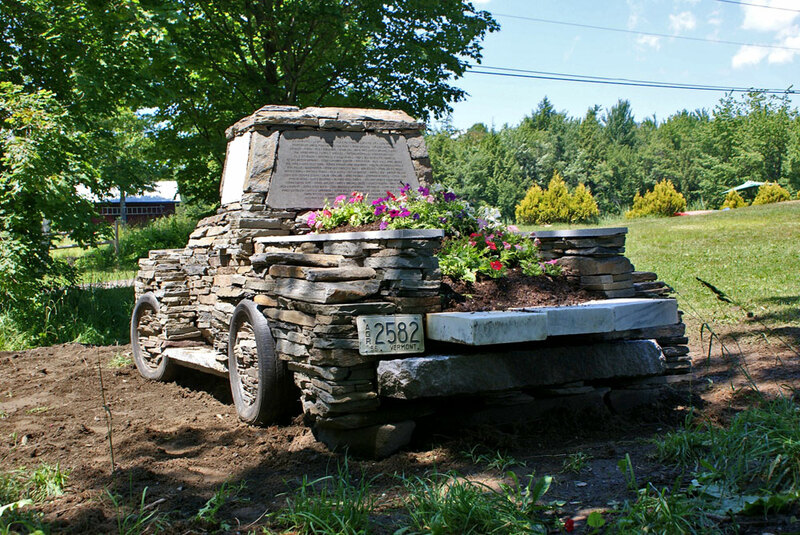 This project is so creative. There are so many junk cars that we can do like that to have a usage. 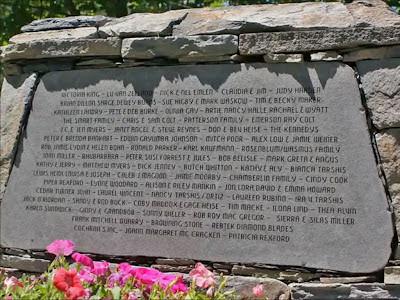 This will be the center of attention of your garden. Thanks a lot for discussing this matter. I concur with your conclusions. I like the idea of this. My favorite is the beetle. It reminded me of the two years I spent landscaping. We built a number of stone walls and it was always a challenge to get them to look juts right. 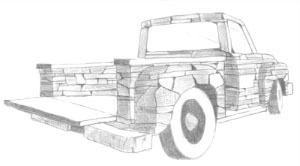 I imagine getting the rocks to look like a car or truck is significantly more so. Thanks for the post. I haven't seen anyone do this sort of thing before. It is a wonderful. What is far more timely as well as relevant when compared with content inspired by simply your weblog opinions? Thanks intended for going in which away. Nice to be visiting your weblog once more. Well this write-up that i’ve been waited for so long.